Gang of Four has always been exciting to watch live: edgy, unpredictable, appearing to threaten to dissolve into chaos & yet never losing the tightness & angularity that is the hallmark of its sound. 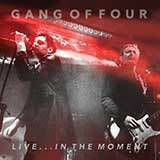 Gang Of Four captured the experience on "Live... In The Moment". Recorded at the penultimate show of 2015, at London's Islington Assembly Hall, with a set list that spans a catalog of over 30 years.